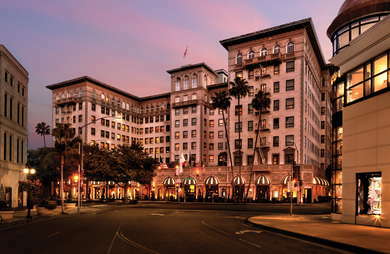 Built on the site of an old racing track, the Beverly Wilshire has been an LA landmark hotel since 1928. If you were to call something ostentatious without it being insulting, you could get close to describing its vibe and style. 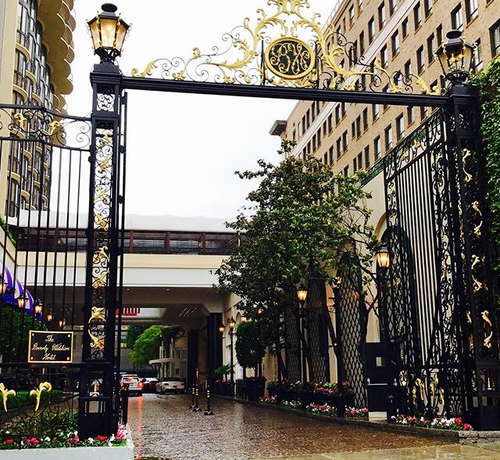 Classic and ornate gates welcome a slew of uber-wealthy international tourists who want to be in the heart of Beverly Hills and across the street from the famed Rodeo Drive. But beyond the showiness, there’s also something special about this place that was once home to luminaries like Warren Beatty, Elvis Presley, and Steve McQueen, in addition to being the star in numerous Hollywood films including Beverly Hills Cop and Pretty Woman. The hotel has nearly 400 rooms, of which 137 are suites. If you want to live like Hollywood royalty, definitely check out the Wilshire Presidential Suite with its colonnaded entryway (and filming location for Pretty Woman). There are balconies in practically every room and all come with free Wi-Fi, thick terry cloth robes, and an in-room app that controls all guest service needs. The old-timey elevators have small seats in each back corner. Plop down and ride in style, friends. Bathrooms include standalone showers and sunken tubs surrounded in marble. Vanity makeup mirrors are great for red carpet walkers. And Salvatore Ferragamo makes the take-home-worthy bath products. The Beverly Wilshire is divided into two separate buildings, but the main lobby has grand staircases, marble floors, and bright chandeliers hanging over fresh flowers. Around the lobbies are a variety of boutiques selling clothing and jewelry. YOU SHOULD KNOW Day and night, the lobby is filled with gawking groups of tourists. If you want to avoid the masses, you should probably just avoid this hotel. 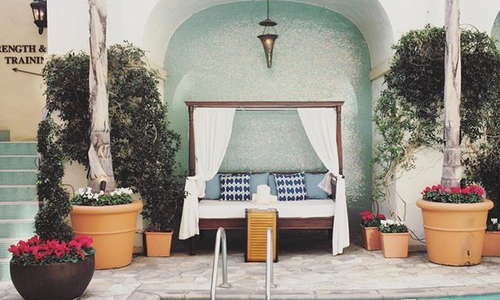 A guests-only, Mediterranean-style pool has ample deck chairs and for-rent cabanas for hot summer days. The hotel staff attends to all needs with water spritzers, boozy smoothies, and anything else you could want or need. Nine treatment rooms provide guests with an endless array of pampering options from facials and body wraps to nail services and massages. Want the finest things in life? How about a Diamond Rose Body Treatment that has actual diamond dust to help you exfoliate? Would you like that? Well, you're in luck--they have that here. A good-sized fitness center has Technogym cardio equipment and weight machines, as well as free weights. Guests who want more personal attention can request a private trainer. The hotel also offers yoga classes if you need some mind and body balancing after your diamond-dusting. For standard breakfast, lunch, and dinner with California fare, The Blvd is a sophisticated spot with a large dining hall, elongated bar and sweeping windows that stare out at Rodeo Drive. CUT, meanwhile, is a top-rated steakhouse by chef-impresario Wolfgang Puck. If you’re looking for more casual dining, guests can head to the Pool Bar & Café for burgers, sandwiches, and salads. Both CUT and The Blvd have bars where drinkers can grab quick bites while they imbibe on whiskeys and craft cocktails. Both bars can get rather sceney, especially on Whiskey Wednesdays at CUT. Being in the middle of busy Beverly Hills has its privileges from a walking standpoint. You’re never more than five-minutes away from elegant shopping, high-end cuisine, and bars. The hotel also provides a complimentary Rolls Royce or Mercedes to shuttle you around if you need to go a little bit farther. There’s no metro access here, but taxis are easy to come by, as are ride app companies like Uber or Lyft. Renting a car is probably ideal if you need to reach the beach or the Valley, but know that parking here won’t be cheap. Barney’s is next door to the hotel, and the top floor has Freds Beverly Hills (2-minute walk), with great salads, pizzas, and burgers. If Wolfgang’s steak isn’t your style, you can try his inventive Cali-cuisine at his ultra-famous hotspot Spago (4-minute walk). Whiskey lover? Try £10 at the Montage Hotel (5-minute walk) for rare blends--ask the hotel concierge to get you a reservation, though. If you want something quiet yet refined, slip into Honor Bar (3-minute walk) for martinis and clever craft cocktails. With the largest concierge team in LA, there’s literally no request that this hotel can’t grant. Tickets to private shows, reservations to impossible restaurants, or special gift items for the room are all within reach. 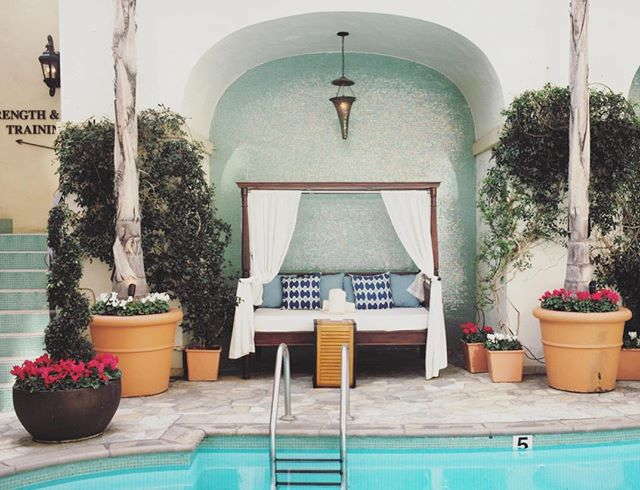 Location-wise, this hotel is in the middle of Beverly Hills’ busy shopping district. This is great if it's why you came to LA, but if you want to avoid throngs of tourists, you might get annoyed here. Glitzy, glamorous, and a little bit gaudy (in a good way), this hotel attracts a well-heeled international clientele that expects a level of service and pampering that the Beverly Wilshire is all too happy to provide.